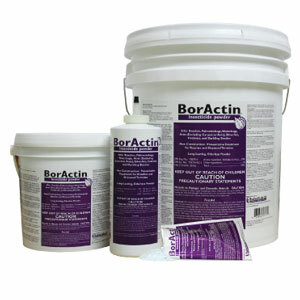 The broad label of BorActin Insecticide Powder, a non-repellent dust, allows for a wide choice of application methods such as a liquid spray, foam, or as a mop solution or drain treatment. The product combats such crawling insects as cockroaches, ants and silverfish, as well as drain flies. It can be used in residential, commercial, industrial and agricultural applications, including both food and non-food areas and for darkling beetle control in poultry houses. Precision milling in pharmaceutical-grade equipment yields a superfine, odorless powder with no clumping and superior “dustability.” BorActin contains 99 percent boric acid as the active ingredient, and is not corrosive to stainless steel. It remains active until removed, and will not break down in heat or ultraviolet (UV) light. It is sold in a one-pound bottle, a five- and 25-pound pail, and in a box of 36 four-ounce mopping packets.